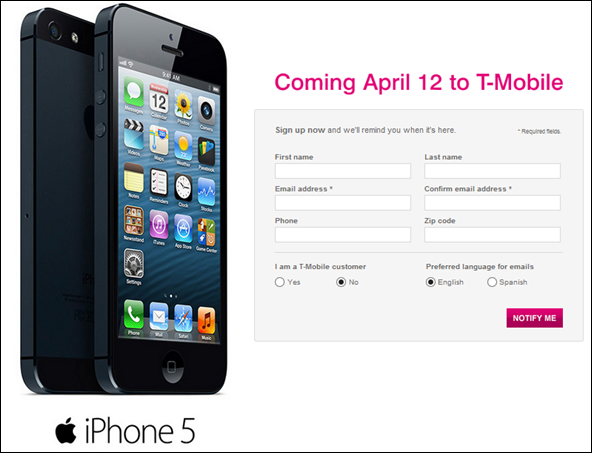 After what has seemed like an eternity in waiting, T-Mobile will finally begin carrying the iPhone 5 from April 12th. The carrier, which currently sits behind AT&T, Verizon and Sprint in the pecking order in the United States, will be the fourth major network to offer the Cupertino handset after the aforementioned, and as well as being compatible with T-Mobile’s just-launched LTE network, there’ll also be HD voice thrown into the mixer. The pricing structure is also rather impressive, with a 16GB iPhone 5 costing $99 up-front, followed by 24 monthly installments of $20. As part of the company’s "Uncarrier" initiative (and naturally, to entice consumers away from the Big Three), T-Mobile is offering a largely different package to those currently available. A couple of years back, carriers across the world decided twelve month contracts were not enough, and now the vast majority of agreements stretch over two years. But T-Mobile, sensing the general feeling of angst among the consumer market, will allow buyers the option to pay for the device outright, or spread the cost over 24 months. This means that the 16GB iPhone 5 will cost $99 initially, and $20/month over 24 months, while the iPhone 4S will cost $69.99 and the iPhone 4 $14.99 – both with that $20 monthly cost. T-Mobile’s strategy certainly has the potential to change the way the market currently operates. There’s very little in the way of consumer choice, and where a twelve month contract was once the de facto length of agreement, the minimum one can find on a major carrier is now at 18 months. By allowing consumers to purchase the device outright, or in manageable installments, they will, in turn, only be charged additionally for usage, with no premium being made on the device itself. The smartphone industry is greatly monopolized, but if T-Mobile’s launch on April 12th proves to be a hit, the likes of AT&T, Sprint and Verizon will be forced into reconsidering the current system. Exclusives on new devices force early adopters to tie themselves into a lengthy contract they may not want, but with the US’s fourth carrier seemingly being the cat among the pigeons, it will be interesting to see if it can force some changes. There is, of course, no word on whether consumers will be able to break out of the 24 month payment agreement by paying a lump sum up front, but that should all become clear at some point in the near future.